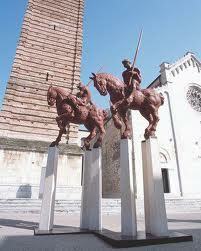 A trip to Pietrasanta is an artistic journey and an inner experience as well. Just strolling around becomes a visit to an open air museum which winds through the streets and squares. 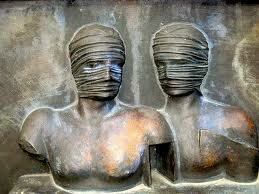 The many sculptures the visitor bumps into witness the close relationship between Pietrasanta and artists. That is the meaning of the International Park of Contemporary Sculpture which includes more than 40 works by international artists such as Cascella, Botero, Yasuda and Mitoraj . 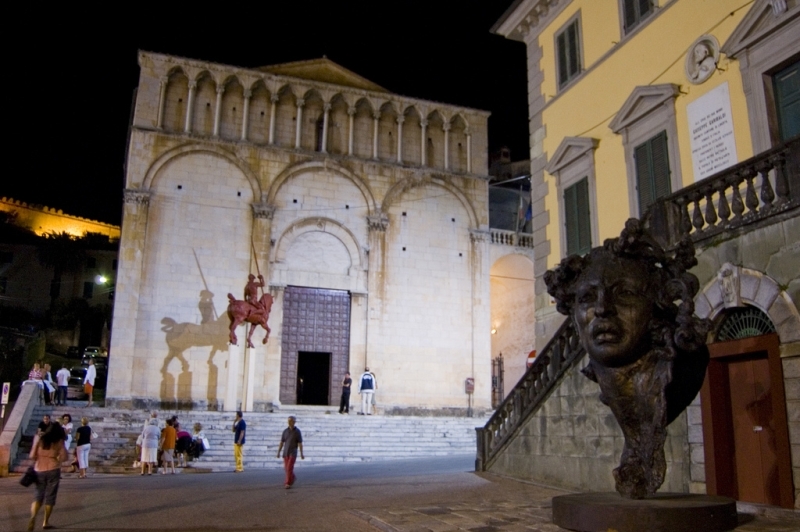 Some, like Mitoraj, have chosen Pietrasanta as their hometown, while others, tied to the town by a strong feeling , often come here to organize exhibitions. Even characters belonging to the stars system are habitués in Pietrasanta. We are speaking of Gina Lollobrigida, actress turned into an artist who often exhibits here. You can easily meet artists in the streets or restaurants. The whole life of this small town turns around art. 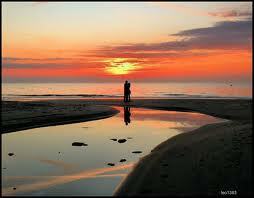 You can count plenty prestigious art galleries, marble laboratories and artistic foundries. The Museo dei Bozzetti “Pietro Gherardi” which owns sketches of sculptures by artists who realized here their works is a real must. 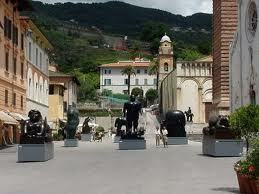 Pietrasanta is a permanent lab, art is in the air, it is something you breathe. Ex Marmi, a short walk from downtown, is a large ex marble lab, completely renovated for great international events, theatre, music, dancing and film workshops. The Garage Bonci Officina d’Arte organizes art courses to give everybody’s dreams a chance . Professors and students plan, at the end of each session, the Art Gallery, a free exhibition of the realized works. 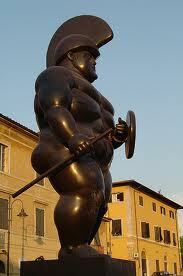 The highly impressive Warrior by Botero, a gigantic bronze statue, placed in the central square, shields symbolically the town’s old treasures: the thirteenth-fourteenth century San Martino Cathedral , the Romanesque Sant’Agostino cathedral with its baroque belfry and cloister and the Church of San Giovanni e Santa Felicita. The modern and the old have successfully established an on-going dialogue. 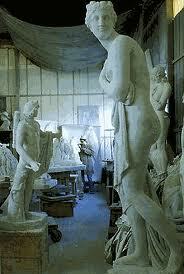 The history of Pietrasanta deserves a respectful attention. Founded in the thirteenth century along the Via Francigena, the medieval road walked by pilgrims on their way to Rome, it fell under the control of Pisa, Lucca, Florence and Genoa. Sold in the fifteenth century to France it enjoyed in the 17th century a period of great economic development, thanks to the marble quarries, the iron industry and the drainage by Cosimo the first of the Medicis. Let’s mention, at last, Marina di Pietrasanta and its Versiliana, a gorgeous park in front of the sea rich in literary memories. Its villa hosted various writers and enhanced its magical aura by the passionate love story between the poet Gabriele D’Annunzio and the dancer Eleonora Duse. Nowadays it is the right venue of summer events. In a natural amphitheater, surrounded by maritime pines, international ballet dancers and theatre companies offer locals and tourists their summer premiéres. A romantic weekend is worthwhile in Versilia, a such astonishing backdrop where the glorious Apuan Alps gently embrace the Tyrrhenian Sea. You can profit from the nearby low-cost Pisa airport and the accommodations offered by Tuscany Holiday Rent to really enjoy the unjustly unknown charm of the sea in wintertime.